A classic Italian combination is a slice of meat paired with fruit like prosciutto with melon or even figs. Roasted Italian Sausage And Grapes (seedless green, red, or both) is a roller coaster for your taste buds combining flavors and textures. Seedless green or red grapes, when in season, are bursting with sweetness. This dish is usually served with a loaf of crusty bread for dipping. I’m changing up the traditional Roasted Italian Sausage And Grapes. I’m going to be adding potatoes, a perfect accompaniment to this dish, a complete one-pot meal. Potatoes were a huge part of my mom’s recipes. I suppose this is where my English influence comes into play. I’m not stopping there, for some added color and flavor, roasted sweet bell peppers, YUM! There are a couple of different ways you can make this dish, you can choose to use half hot and half sweet Italian pork sausage, that’s traditional. 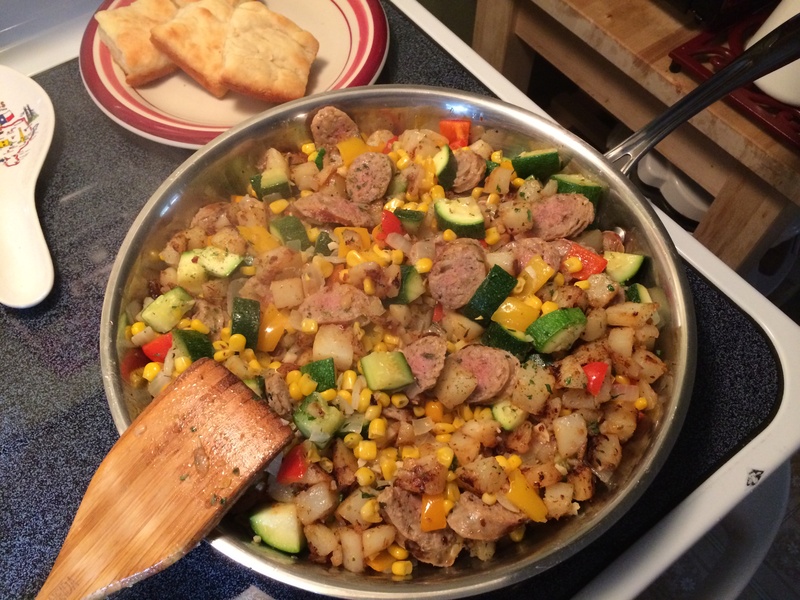 You could even substitute Italian style turkey sausage or Italian style chicken sausage. 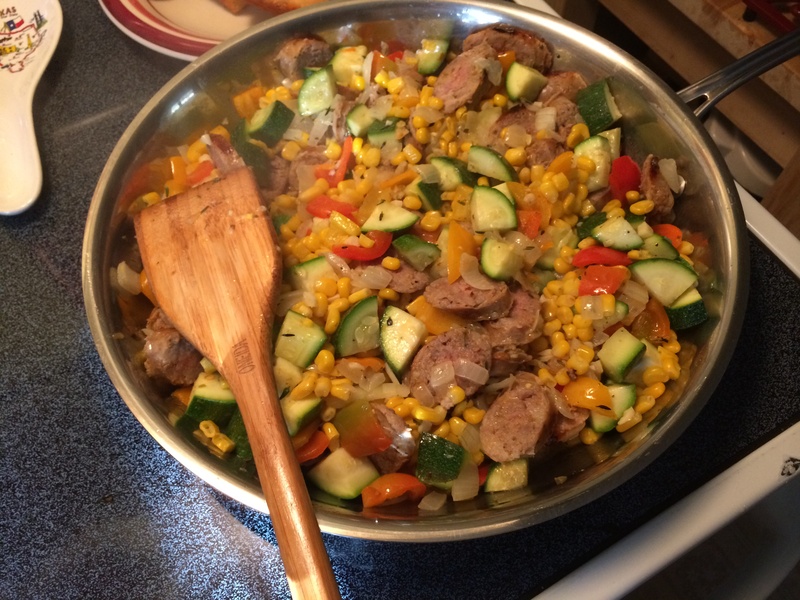 I’m going to use a leaner and less fatty option, mild Italian chicken sausage for this recipe. If you’ve never tried roasting grapes, well… you don’t know what you’re missing. They add amazing sweetness to this dish. A perfect harmony of savory and sweet flavors. Let’s get started. 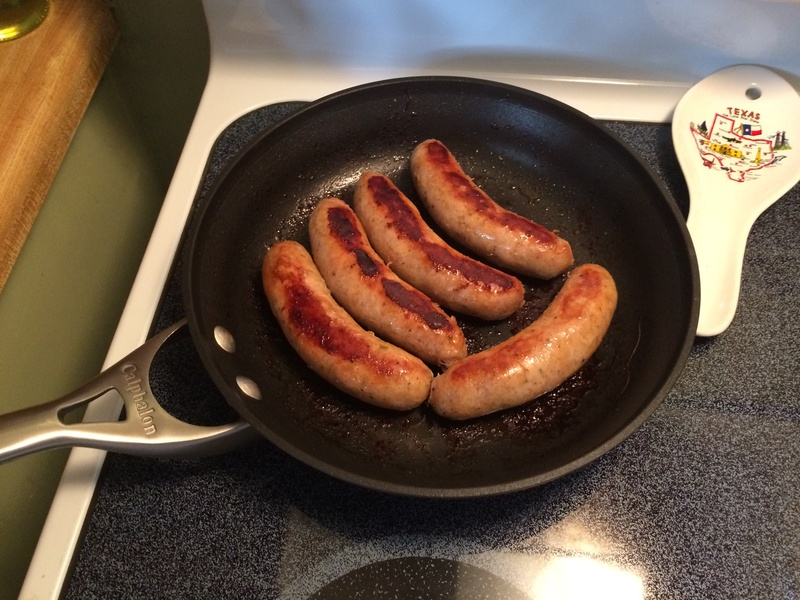 You can see above how much leaner the Italian chicken sausage is from the traditional Italian pork sausage. Note: Cooking Times may vary slightly. If any or a few of the potatoes are larger than most, cut the larger ones into quarters. The potatoes need to be similar in size. First, slice the potatoes in half. Add the halved potatoes into a large pot, cover the potatoes with cold water. On medium-high heat. Bring the potatoes up to a boil. Continue boiling the potatoes for 12-15 minutes, or until just fork tender. They’ll finish cooking in the oven. Note: Cooking times may vary slightly. Using a fork prick each of the sausage links 3 times on each side. Pour 1 quart of unsalted chicken broth into a large sauce pot, similar to the one in the picture above. Place the 10 sausage links into the pot (make sure the liquid covers the sausage links, add water if needed), turn the heat to medium, and cover. Parboil the sausages until grey throughout, about 12-15 minutes. The parboiled sausages and potatoes should be done around the same time. Preheat oven to 500 degrees F.
While the potatoes and sausages are on the stove being parboiled, prep the grapes, peppers, onion, and garlic placing them into a large mixing bowl. Add 1 tablespoon of Kosher salt, 1 teaspoon of black pepper, and 1/4 cup of olive oil, tossing to coat with oil and seasoning. Next, using tongs, transfer the sausage links to a plate lined with paper towel. Drain the potatoes and transfer them back into the same pot. This will allow (because the pot is still very hot) any excess water to evaporate from the potatoes. Set the pot aside for a minute. Once the potatoes are free of any excess water, move onto the next step. Place the potatoes into the baking dish first. 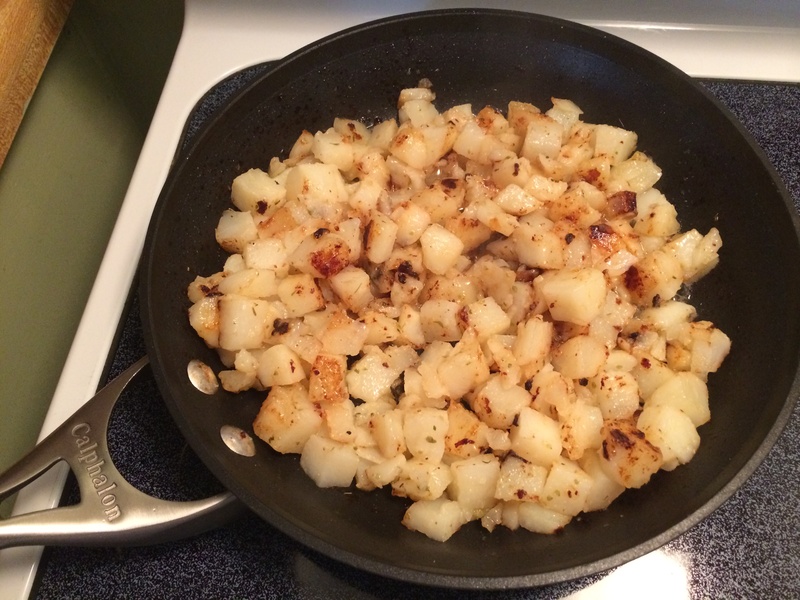 Add 1 tablespoon of Kosher salt, 1 teaspoon of black pepper, and 1/4 cup of olive oil, toss to coat all the potatoes. Add the grapes, peppers, onions, and garlic mixture to the baking dish. Using a pair of tongs, place the Italian chicken sausage links on top. Pour the chicken stock and red wine all over the top. Finally, place the 3 sprigs of rosemary on top. Roast in the oven for 25-30 minutes. Turning the sausage links halfway through the cooking process. This allows for both sides to brown really well. Remove the baking dish from the oven. Remove the rosemary sprigs. Using a ladle remove 1/2 cup of the cooking liquid from the bottom of the baking dish. Cover the baking dish to keep everything warm. Using a ladle, remove the cooking liquid from the bottom of the baking dish to a measuring cup. In a small sauce pot, pour in the cooking liquid. Next, add the balsamic vinegar. Turn heat to medium-high, whisking occasionally, cook allowing the vinegar and juices to reduce and become thick and syrupy around 5 minutes. Pour the Balsamic Glaze over the sausages and grapes. Garnish with fresh rosemary sprigs. Bring the baking dish right to the table Set on a using a trivet. Serve hot and family style. This is one of those recipes that work really well when its cold out. I poached Italian sausage in chicken stock so I could get a good head start on the cooking process. I poached them for around 30 minutes, then I took them out and browned the outside of the sausages for extra flavor (I saved the fat from the pan to cook my potatoes in) and set them aside while I got everything else ready. When I make hash of any kind I choose the veggies that I think go best with that protein. I used red, yellow, orange bells peppers, 3 diced zucchinis, a Fresno pepper, onion, garlic, peeled, 1 inch diced potatoes,1/2 a package of frozen corn. and of course kosher salt and pepper. Now when I saute the veggies I start with the onions and garlic, and finish with the zucchini and last, the frozen corn. For the potatoes I added 2 tablespoons of unsalted butter to the fat that I reserved from the sausages. When this melted I threw in the potatoes and 2 tablespoons of dried oregano, and some salt and pepper and let those cook through and get brown and crispy on all sides. 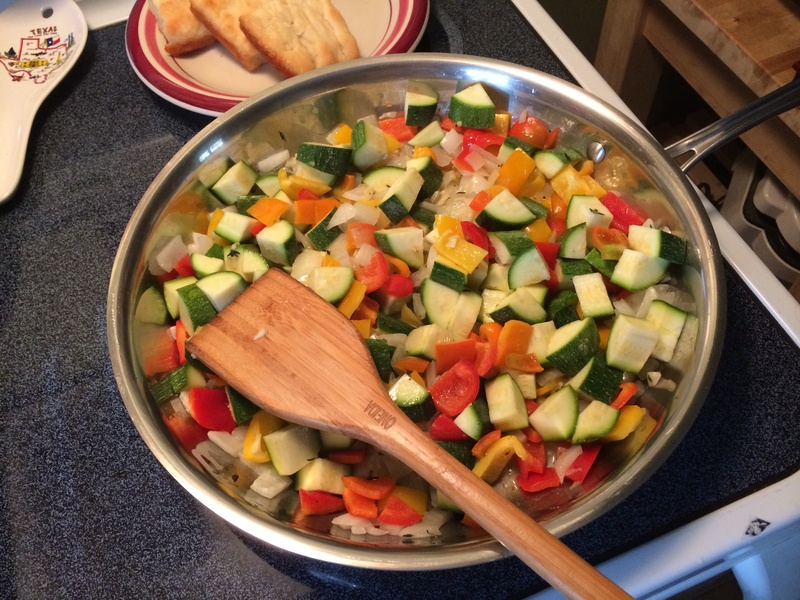 While this was happening I diced and sauteed all my veggies ( I also added 2 tablespoons of tomato paste so it melts in with the onion and garlic) in another large saute pan allowing them all to get nice and tender. I sliced my sausage on the bias and added them to the veggie mixture tossing them through while the veggies were still cooking on a low heat. At this point. I stir in the potatoes gently so they don’t loose their shape. That’s it, the hash is done.